The Secrets of the Spiral 12 Days of Autumn celebration is coming up soon. 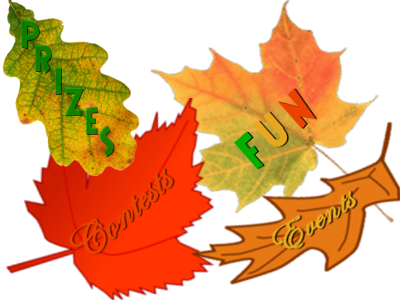 I have several autsome events planned for all of you (even some with prizes)! Below you can see the details of each event. I am hoping that by posting this early, people will be able to plan which events they want to make it to. More information will be posted about each event on the morning it is scheduled for. Description: Put on yer eye patch (if ye have one) and come help kick off 12 Days of Autumn with a huge party! There will be trivia, a fashion contest, PvP, and of course, lots of hanging out with friends! Prizes will be awarded for winning trivia and for the most Piratey outfit. Where: Meet at the Skull Island Docks by the life fountain. Description: Every pirate should be proud of his/her ship! Come show your's off at the 12 Days of Autumn Pirate Ship Parade! We will be cruising around the whole world of Skull Island. There will also be ship related trivia with prizes awarded! Description: Do ye like riddles and scavenger hunts? This is the event for you! There will be friends of Autumn's hidden around Skull Island giving out clues to each location. Be the first to find all the locations and win a prize. There will be 1st, 2nd, and 3rd prizes awarded. *Note* More details and rules will be posted on the morning of the Scavenger Hunt. Description: Join in for pet farming fun! Your feedback has been received and we will be farming Tyson in Cool Ranch for the amazing Armadillo pet! He also drops the Golden Stingtail and Tropical Sky Snake as well! Description: Let's end the 12 Days celebration with a big bang and sink some ships! Come and help fight Captain Spartacos and the surrounding ships for lots of gold, NXP and hopefully some autsome drops!